Boston was built on climate resiliency planning. Early residents gradually filled in low-lying Atlantic Ocean tidelands as the city expanded. They turned small islands and peninsulas into neighborhoods high enough above sea level to prevent flooding from typical tides and storms. Today, some of these areas, such as East Boston and Charlestown, are among the most populated in the city. Faced with projections that the effects of climate change could drive the local sea level upward by as much as 20 cm (8 in.) by 2030 (as compared to 2000), Boston recently developed a broad-reaching plan to keep its citizens, history, and infrastructure above water. 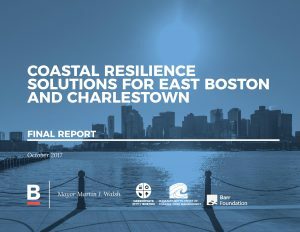 Coastal Resilience Solutions for East Boston and Charlestown is an October 2017 report created by Climate Ready Boston, a city government initiative to identify near- and long-term practices to offset the future effects of climate change. The report recommends flood protection measures ranging through the year 2070 to adapt the coastal city to rising sea levels. City of Boston Department of Environment. At the first-ever East Boston Climate Summit in October 2017, Boston Mayor Martin Walsh announced the completion of Coastal Resilience Solutions for East Boston and Charlestown. The city resiliency initiative, Climate Ready Boston, composed this report, which recommends a set of diverse flood-protection measures to safeguard vital infrastructure. Some measures are slated for implementation as soon as 2020 with others scheduled as far out as 2070. Expert advice and input from more than 400 neighborhood residents led to the suggested measures, which include major roadway elevations and strategic adoption of green infrastructure designed with a focus on redundancy and connectivity. The first step of the initiative will create a deployable, 2-m-high (7-ft-high) floodwall across the East Boston Greenway by 2020. By blocking this crucial flood pathway in anticipation of major storms or abnormal tides, such a floodwall could “protect almost 4300 residents, at least 70 businesses, and critical infrastructure,” the report says. Design and construction of the wall are estimated to cost just $100,000. City planners are working with the Massachusetts Department of Transportation and other public and private partners to design the wall to resist what today would be considered a 100-year flood for the region. Climate Ready Boston anticipates that the Atlantic Ocean could rise 0.9 m (3 ft) in the area surrounding the city as soon as 2070. In that scenario, a 100-year flood would contain about six times as much floodwater as would one in 2000. East Boston, which includes nearby Boston Harbor, contains more land area and permanent residents than any other neighborhood in the city. Built on low-lying land adjacent to the Atlantic Ocean, the city is among many coastal urban centers already bracing for intense storms and unruly tides. Kathryn E. Macdonald/U.S. Navy. With this gap in mind, the report provides forward-looking recommendations to elevate new developments and embrace the natural buffering properties of Boston Harbor-area land features. Late-stage flood protection projects will scale in size with the changing definition of a 100-year flood. 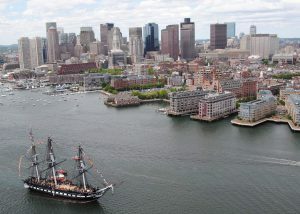 With the report’s completion, Boston joins a growing number of major American cities looking toward climate resiliency. After Hurricane Sandy, New York City announced a $19.5 billion resiliency plan in 2013 with recommendations identified through the 2050s. Los Angeles has a long-term sustainability plan underway through 2035.